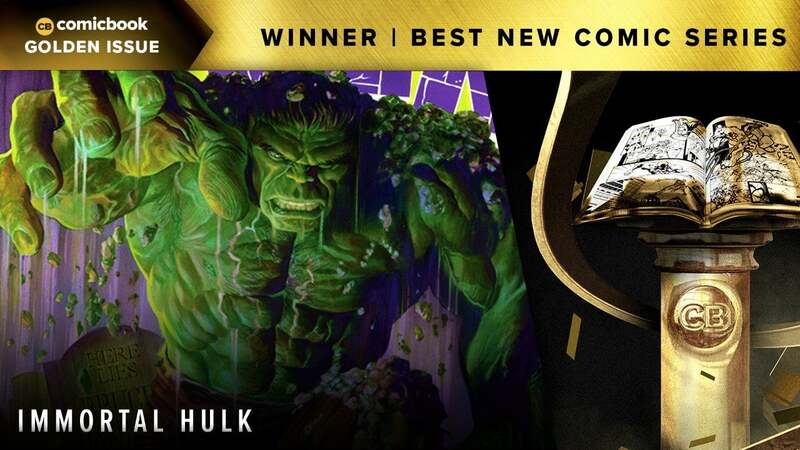 As we near the end of 2018, awards season begins to ramp up, and with that, another iteration of ComicBook.com's Golden Issue Awards. In an effort to celebrate the best of content released in the past 12 months, the ComicBook.com came together to determine the favorites across all platforms of entertainment including movies, anime, games, television, and comic books. Each year, the comics industry sees hundreds of new comics released from dozens of publishers. After a nomination process, the ComicBook.com staff has narrowed down the staff's favorite comic series that debuted this year to a tight five -- but there can be only one winner. The Immortal Hulk by Al Ewing, Joe Bennett, Ruy Jose, Paul Mounts, and Cory Petit! Led by Golden Issue-nominated writer Al Ewing, The Immortal Hulk deconstructs the gamma-infused Bruce Banner down to his core, making for a modern retelling of Robert Louis Stevenson's Dr. Jekyll and Mr. Hyde. Having finally come to terms with the fact he's unable to die, Bruce Banner tries his damnedest to keep control of the demon inside, often times to no avail. Ewing's able to put focus on the fact that Banner is his own worst enemy which, in turn, creates a harrowing tale that will keep you on the edge of your seat. But in comics, words only go so far, and the entire art team deserves just as much credit. Led by artist Joe Bennett, the art of The Immortal Hulk deftly matches the dark and grim tone of the situation at hand. Between portraying the Hulk as the monster he is, there are select panels throughout the series that make the tensions behind Banner's struggles palpable. To top it all off, the entire series features covers from the legendary Alex Ross. Need we say more? For being the title of a character who's one of the oldest in Marvel's stable of characters, Ewing and company have been able to craft a tale with The Immortal Hulk that's fresh, intriguing, and quite frankly, the best new comic series to debut this year. In your travels this week, be sure to stop back at ComicBook.com to see the rest of this year's Golden Issue winners as they're announced. Please do let us know what your favorites are in the comments!